He risked his camera to get the shot, and for good reason! 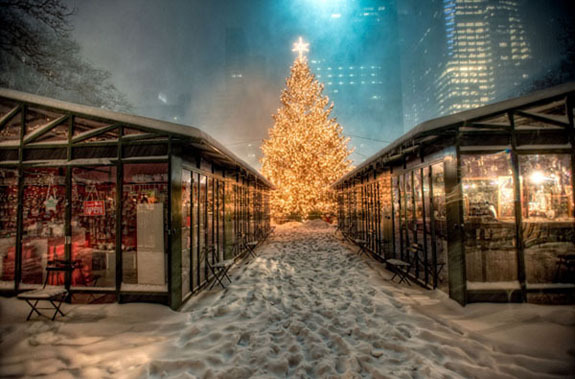 We chose this incredible image by Tim Gibson of NYCHDR as the winner of our Holiday Photo Contest on Flickr. The photo can be seen in the rotation of images on our homepage, bryantpark.org, during the month of December (refresh the site a few times if his image doesn't show up first), and will be featured on the front of our company holiday cards this year. Read Tim's account of how he got his shot during a snowstorm (it includes a plastic bag and hair tie) at nychdr.com. Congratulations to Tim and a big thank you to everyone who entered our first contest through Flickr. We love seeing your photos of the park, so until our next contest, we hope you'll add them to the Bryant Park NYC Group on Flickr.